Once again, financial aid experts from three area higher education institutions are teaming up to give free help to students in completing the Free Application for Federal Student Aid (FAFSA) and other financial aid forms during the state’s fifth annual College Goal Sunday event. College Goal Sunday financial aid workshops will be held from 1 to 4 p.m. Sunday, Feb. 9, in Room 219 of the B&O Building on the Wheeling campus of West Virginia Northern Community College, 1704 Market St., and at 24 other locations across the state. Financial aid experts will be on hand from WVNCC, Wheeling Jesuit University and West Liberty University. Students who attend a College Goal Sunday workshop will be entered to win an Amazon Kindle. Anyone who is planning to pursue some form of education and training beyond high school within the next year should complete the FAFSA. 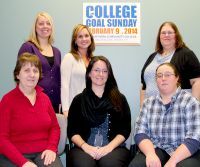 College Goal Sunday workshops are open to students of any age or income-level. The College Foundation of West Virginia coordinates the event. Students can pre-register, find locations, and view a list of items to bring by visiting www.cfwv.com, the state’s free college- and career-planning web portal. Students and families should bring a driver’s license, both the student’s and parent’s Social Security number, 2013 tax records (or 2012 records if 2013 forms are not yet available), 2013 untaxed income records and information about investments and bank account balances.